In Family Portrait In Black And White, middle-aged single mother Olga Nenya decides to brave social stigmas to foster 17 orphans, many of whom are Ukranian-African. As the film opens, one sees third-party interviews with Ukranian skinheads that immediately couch the film in a setting of acial discrimination. Given the film’s title, its synopsis, and these opening sequences, one expects the entire film to be about the struggles of foster parenting in a mixed race family — but this expectation would be wrong. Nenya and her seventeen foster children live and work on a farm, slightly removed from the mainstay of Ukranian society. Through the use of minor anecdotes, the film asserts time and time again that racism and discrimination are wildly prevalent in Ukraine — but this narrative is not the primary focus. The film is, in fact, less sociological than it is an intimate look at the psychology of foster family life and the complexities of motherhood both outwardly inflected upon Nenya, and self-inflicted and self-perpetuated. After a slightly threatening visit from Ukranian inspectors who point out that Nenya has improper sanitation facilities in her home, Nenya pities herself and says in tears, “I’ve committed a terrible crime. I’m raising children no one else wants.” One certainly applauds her efforts to parent otherwise unwanted children, but one quickly gets the sense that she has bitten off much more than she should chew. the children respond in similarly negative and positive ways. Nenya raises her children with plenty of love — but it is, in a sense, love that is dominated by authoritarian control. The more obedient of Nenya’s children share tales of being abandoned and sacrificed to other unloving foster families, and when they swear allegiance to Nenya, her strong points become evident. On the opposite end of the spectrum, however, Nenya’s more free-spirited children find themselves constantly smothered by her overbearing nature. In the name of good parenting, Nenya decides for her two boys, Kiril and Roman, that playing music and soccer are against their best interests. She goes as far as commanding Kiril not to whistle inside her house, lest he desire to be kicked out. Kiril is later disowned by his mother for his desire to leave the family and pursue higher education, while Roman waits desperately to be old enough to be reunited with his biological Ugandan father. The cirumstances which are most telling of Nenya’s possessiveness, however, come with regards to the adoption of her children. 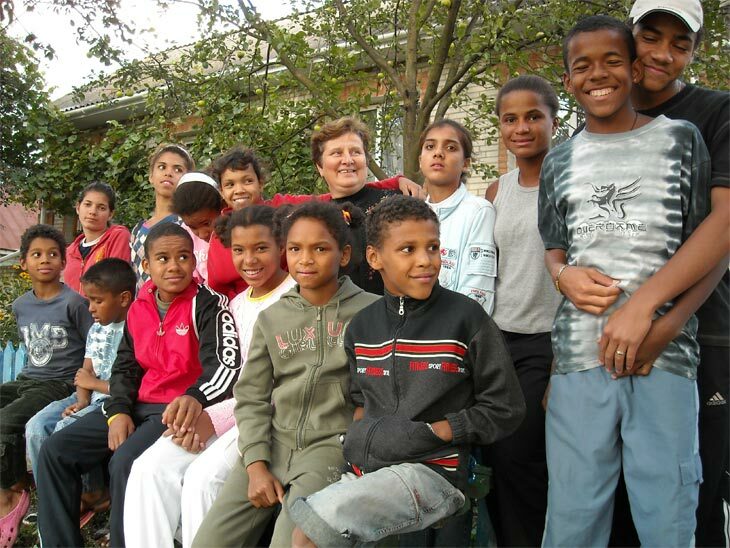 Every summer, seven of Nenya’s children are given the opportunity to live abroad with other families. Ana and Maxim are both given adoption offers from their Italian host families — but Nenya denies Ana permission, though she is a teenager old enough to make her own decisions, and goes as far as attempting to hide Ana’s passport. A pair of contradictory statements are also telling. In the first, Nenya says almost heroically into the camera, “I tell them, ‘Grow up, fly away, make your own nest. '” In the second, when discussing Maxim’s adoption, she calls his host family “strangers with good hearts,” despite the fact that they have known him for four years. When the interviewer proposes that Maxim might now have two families, Nenya hums and says, “A baby bird should only have one nest” — and one is quite certain that the one nest is to be one roosted by Nenya, and Nenya only. Family Portrait In Black An White is punctuated slightly by commentary on the state of racism in Ukraine, but that setup is a misleading one. The only portrait one truly sees in the film is that of the difficulties of foster parenting, as found mostly within Nenya’s household.